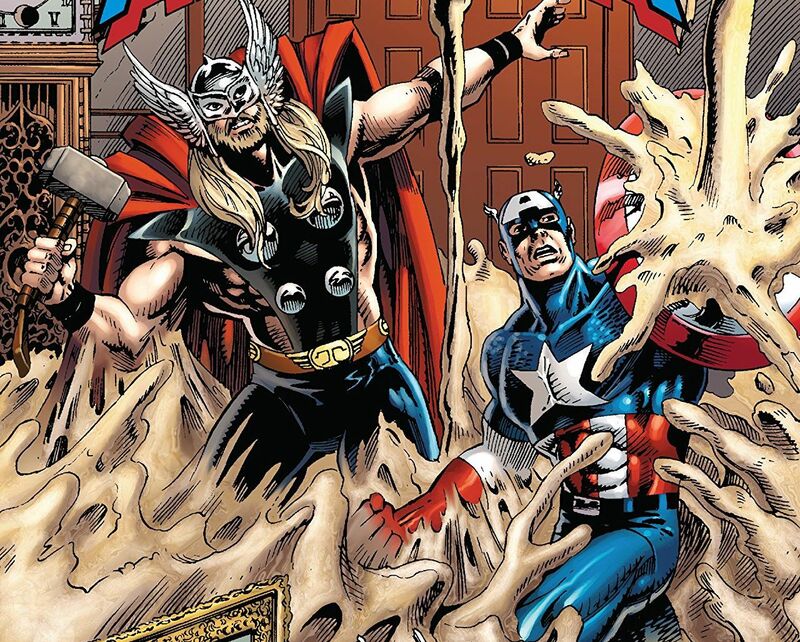 The bizarre, inappropriate, and excellent 'Captain America Epic Collection: The Superia Stratagem' – AiPT! Read some of the craziest 90s Captain America stories ever. Captain America is a character I believe Marvel hasn’t always been sure of how to use. Whether it’s his ties to World War II, or simply because he wasn’t the flavor of the month, the character seemed to have been sent on his way on a motorcycle to fight crime just because. The early ’90s exemplify this, as this collection shows. Here are three big takeaways from this Epic Collection you must know. Hell hath no fury! Captain America faces a threat like never before when Superia raises an army of female super villains – from Anaconda to M.O.D.A.M.! The roguish gun-for-hire Paladin lends a hand to face these Femizons, but can these two mismatched adventurers thwart Superia’s stratagem? Then, Cap has a showdown with his German counterpart, Hauptmann Deutschland. Both men are after the Red Skull -until they discover that he’s been killed by Scourge! But nothing is ever as it seems with the Skull… Plus, Diamondback seeks a quiet life -as Cap’s executive secretary?! Bernie Rosenthal returns! Cap takes on Crossbones, Viper, Taskmaster, Jack O’Lantern, Doughboy and more! And journey back to World War II for a fresh look at the origin and earliest adventures of Captain America and Bucky! This collects one of the craziest story arcs involving a supervillain who wants to turn Captain America into a woman and let women rule the world once and for all. It also features a crazy creation in villainy named Doughboy, and houses one of the best runs on Cap ever in Adventures of Captain America #1-4. Captain America #387 through #397 was a wild time for the character in the early ’90s. You’re going to do what now? I could not believe my eyes as I read the main story of this collection. It all has to do with a mysterious cruise with only women on board, one of which is Diamondback. Cap is out to save her and is pulled into what she’s been up to, which involves a supervillain named Superia. She’s super strong and has a super plan. Before she lets us know what she’s up to, she captures Cap and lets it be known she will be turning him into a woman. Say what?! She’s infusing Cap and Trapster (along for the ride with Cap) with estrogen as a means to blackmail Cap to do whatever she wants or he’ll never be turned back into a man. There’s a bigger plan involving the alternate reality of Femizonia, sterilizing the entire human race, and other such crazy ideas, but you get the picture. The entire arc ends with Cap fighting Superia in a fist fight to “prove to me that women are better than men.” It’s quite a story and would never fly today, but it’s fun nonetheless to see what kind of comics were out back in the early ’90s. Oh, and a female MODOK works for Superia named MODAM. Seriously, it’s too cooky to resist! For the longest time, Red Skull was some sort of super Nazi so powerful even Hitler feared him. Then Cap made it back to our time and his role kind of lost its meaning. This collection aims to let Red Skull reclaim that. Serving as much more than a gangster or goon, we learn about midway through he’s pulling the strings of many different groups. There’s a sort of mini-story following Red Skull throughout the first half of this book following his exploits as he fights Captain Germany (aka Hauptmann Deutschland), goes on trial and is even saved by Captain America himself. It’s a wild ride. This being an epic collection it contains all the stories that came out around the same time. That includes Adventures of Captain America, which I reviewed a little over a year ago when it was released in its own collection. Taking up half this book, it serves as an excellent example of a Cap story done right. It’s a slight twist on the character, but damn is it well written and drawn. It’s a great example of a superhero story being so good you could like Cap or dislike him and still enjoy the read. Woof, aside from the things I mentioned above, the first 200 or so pages of this collection can be hard to get through. Trapster joins Cap and it takes pages upon pages for them to get going. Then they’re shot out of the sky, must fight for their lives in the ocean, and then end up on a party cruise where Superia plots. It’s kind of neat Superia of Thundra, I guess, but overall it’s old school comics written in a way that suggests there wasn’t a plan. Or at the very least it was loosely followed. There’s also quite a bit of sexualization of the female characters. There are a few examples of women in bikinis that makes one wonder if the cruise location was picked so as to show off female bottoms. The art is great, but there’s also a lot of crotch shots either at odd downward angles or with characters flying around so their crotches are exposed. A different time for comics, I guess. The insane first half of this collection effectively serves as entertainment due to its historic implications. The second half is devoted to the highly entertaining Adventures of Captain America, so all in all this is a great read. What an insane first half of this collection is effectively serving as entertainment due to its historic implications. The second half is devoted to the highly entertaining Adventures of Captain America so all in all this is a great read. Uncanny X-Men #14 review: Lots of surprises, and a new teammate?